Incoming RI President Ravi Ravindran’s theme for next year is “Be a gift to the world.” And as Secretary John Hewko recently said, “We are on the verge of leaving the world a gift that will last for as long as humans inhabit this planet.” A planet free of the polio virus. How’s that for being a gift to the world? Polio, as you all know, is a devastating virus that most often attacks the young. And when it does, it dramatically changes lives forever. There is no cure…but there is a prevention. When Rotary started it’s fight against polio, there were 350,000 children per year contracting the virus. Today, year to date (as of April 29th) there are only 33 new cases worldwide. Our speaker will be Bob Rogers. 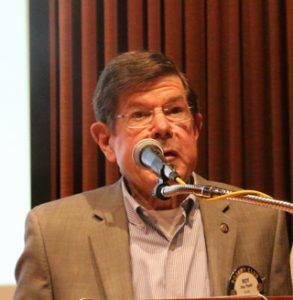 Today Bob will be giving us a brief history of polio, how Rotary got involved, where we are now and the strategic plan to finish the job, as well as some vignettes of personal stories. 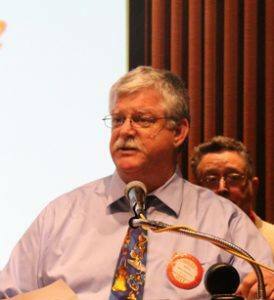 Bob has been a Rotarian since joining the Rotary Club of Sebastopol in 2007. As a polio survivor, he got involved right away with PolioPlus at the club level, and in 2011 joined the District PolioPlus Committee under Larry Myers. 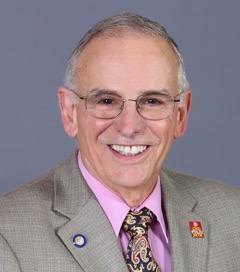 Bob was president of his club last year, is now an Assistant District Governor, and was recently selected as the District Governor Designate for 2017-2018 (The year Rotary plans to End Polio :-). 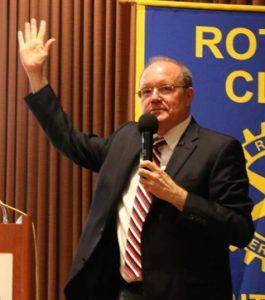 He spent his career as an airline pilot, retiring from USAirways…and now he say’s his second career is Rotary. President Mark Burchill may have become one with the Club bell today when he artfully rang the bell while searching for the Lost Chord. We are the Club where “service and fellowship come together.’ The Pledge of Allegiance was led by Jackie McMillan. Doug Roberts brought the Thought for the Day which included two wise quotes from the late actor/comedian Bob Hope. Casey D’Angelo introduced our only visiting Rotarian, Chris Parr from the West Santa Rosa Rotary Club. (Realtor), Robby Meyers (Online Marketing), Norman Sheehan (Health Insurance), Ryan Kelly (Marketing) and Lorne Silverstein (Solar). Karen Ball introduced her guest again, Barbara Kanowick (Organizer). Doug Chase hosted Michael Rice, DDS (Dentist). Denise Oldfield (Loan Broker) was introduced by Kerrie Chambers. Troy Aldrich (Auto Body) was the guest of Past President Rich de Lambert. Doug Braik (Realtor) was introduced by Peter Holewinski. This months’ recipient is no stranger to us, as he works tirelessly behind the scenes on the Club budget and finances, including handling the money at the weekly Club meetings. You’d think such a person’s sense of humor might be missing, but you would be wrong. His humor is medium-dry and witty. His name is Roy Thylin! Congratulations, Roy! A retired CPA, yes; but, once-a-CPA-always-a-CPA. Peter Holewinski chose Steve Marburger (of the above-referenced “Following”) as the worthy recipient of today’s award. Eileen Carlisle brought only sunshine today – we are all above the weather today. 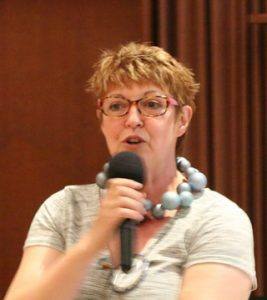 Gesine Franchetti, of Rosso Restaurant fame (3 restaurants & catering), gave us insight into her business. Her newest location at 1229 North Dutton Avenue (Santa Rosa) is all about celebrating events – where there is plenty of space to rent for private dinner parties. They are open for breakfast, lunch and happy hour (which may extend into happy hours). The Club By-laws committee was charged with updating our Club by-laws and they issued their nine-page proposal, streamlined from nineteen pages, and conformed in all respects to the Rotary International Constitution. The Club membership voted to approve the updated by-laws, on a unanimous vote. The “Aye’s” have it. Kudo’s to Past President Fred Levin, President-Elect-Nominee Jose Guillen, Tim Fawcett and Jack Atkin who worked tirelessly on this project. One more time – as luck would have it, the Raffle continues to grow – now up to $267 (less the $10 consolation prize to winning ticket holder Cathy Vicini). She had her chance to make money hand over fist, with only four marbles in the bag and now there are three. You know, if it doesn’t get thrown under the bus, then by the end of the day, there can be only One (marble). Our raffle conductor was Jackie McMillan, with the heart of gold, who gave us a run for our money. Past President Debi Zaft – the finder of questions from the May issue of The Rotarian magazine had this question: “ Which Oscar-winning actor advocates for the “No Kid Hungry” campaign to feed school children in America? Answered correctly by Ginny Cannon, it was Jeff Bridges. Hooray and birthday good wishes were sung to nine Rotarians, of which five showed up to collect their gift of official SF Giants peanuts. Yummy. Pass the beer, please. Laura Held provided the spark for this celebration. Even with a birthday cake, you can’t hold a candle to these special Rotarians. President Mark says we have three Bocce ball teams for the May 30 event at Julliard Park. Come out to support our teams, from 10:00AM to 4:00PM (hint: they need it). Ed: maybe that was three-ball Bocce teams and that’s why they need extra support. One of the teams better win, since the ball is definitely in their court. There is a warehouse clearance sale going on in the back of our meeting room – Rotary items that need a new home. The sale proceeds go to End Polio Now. All sales are final. If you can sing, you might be able to buy it for a song. Today, we welcomed back Kerrie Chambers as President Mark gave her a new red badge. Kerrie stepped away from Rotary for a time and is happy to be back in the fold. Kerrie, there’s no place like home! President Elect Nominee Julia Parranto and Past President Rich de Lambert were awarded sponsorship pins for having sponsored new members into our Club (Steve Baime by Julia and Kerrie Chambers by Rich). On July 1, we welcome Jackie McMillan as the new Chairperson of the Program Committee, taking over from Wayne Rowlands. Way to step up to the plate, Jackie! If you have connections for a good program, please pass them along to her. President Elect Doug Johnson urges us to bring family members with us when we volunteer to work the Giro Bello bike ride on June 27. 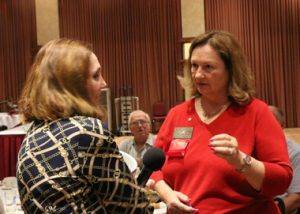 We need more volunteers, and according to Ann Gospe, there is a volunteer sign-up link on our Club’s website. Click away! Past President Rich de Lambert asks for more volunteers for his area – early morning parking and road side assistance during the ride. Wayne Rowlands reminded us that there will be a Rotary Means Business event at 5:30PM on Tuesday, May 12 at the Shone Farm where we will have liberal fare and libations. Be there or be obtuse. Past President Kathleen Archer said that we raised $1,000 at last weeks’ meeting for the Nepal earthquake relief efforts. She thanked Tim Delaney and Treasurer Cecil Humes for their efforts to get money into the hands of our District office for this humanitarian outreach. OF RATS AND BUTTS (BUX)! President Mark found a photo of Past President Steve Olson holding a lady’s purse while going down the stairwell of a building. Looked a bit suspicious until we found out that Karen Ball had accidentally left her purse behind and Steve was returning it to her. Karen paid a $25 finder’s fee to the Club, proving that no crime goes unpunished in our Club. Why didn’t the rat get fined? We need better pest control. Robby!! 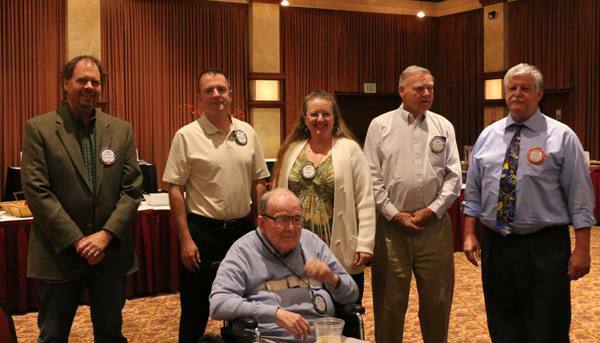 President Mark presented a “Light Up Rotary” pin to Steve Marburger for bringing the most guests to a Rotary meeting. It had nothing to do with Rotary cigarettes. President Mark and Past President Norm Owen paid the price for having many wedding anniversaries – 36 for Mark and 55 for Norm. Mark gave $36 to the Club and another $36 to Polio Plus. Norm gave $55 (each) to the Larry Bello and the John Brown memorial funds within our local Club Foundation. Doug Chase attended a lecture in Japan and stayed over to vacation there, so he felt compelled to give $100 to our local Club Foundation. Matur nuwun! Bob Higgs emptied his wallet for $50 to the Club for having taught Junior Achievement to 2nd grade school kids. He is looking for a replacement for the one-hour per week, five-week stint. Our speaker was Ben Stone, Executive Director of the Sonoma County Economic Development Board (“SCEDB”), on the topic of our local economy. He was introduced by Ann Gospe. The SCEDB has 19 employees and they are happy to report that Happy Days are here again! The outlook is rosy with our county unemployment rate dipping to 4.6% from 11% a few years ago and with upticks in the number of employees in the county, increasing average home prices, increasing consumer confidence and higher beer and wine sales. Median household income is expected to increase during the next five years. Other good news: Ben stated that the cost of doing business has declined and that tourism is on the increase. Co-sharing of office space is increasing and there are more home-based businesses than there were a few years ago. The SCEDB works with local businesses in the areas of planning (business plans), funding (for start-ups), staffing (finding qualified applicants), expansion, diversification (finding the right demographic customer base), upgrading (green business certification), bilingual (networking) and new initiatives to help younger business owners. Ben was a former Rotary exchange student while in high school. He may return to Rotary in his golden years. President Mark thanked all volunteers serving at today’s meeting – Steve Baime and Rick Allen as the official greeters , Matt Fannin and Paul Hamilton for ticket sales, Elizabeth Karbousky as the ticker taker, Jackie McMillan as Raffle Meister, Cathy Vicini as the Mic Jockey and yours truly as scribe. Why is it always an “eye for an eye and a tooth for a tooth?” Why not an eye for a tooth or a tooth for an eye? Because the professional dental and ophthalmology organizations had a joint conference years ago to set the standard for equivalency. They could not agree, so here we are. Take that with a grain of salt. Inquiries have been received today, asking why several prominent Santa Rosa business men are going around the streets walking with a limp, nursing a lame back, or making a wry face. These inquirers, if they had been at the Rotary Club-High School baseball game stated yesterday, would wonder how these business men are able to get to their place of business today. Most of the Rotarians showed in their style of play that they have occasionally swing a golf club. In fact some of the fans near the grand stand said that several of the Rotary Club batters yelled “fore,” before swinging at the ball. Ed Toney, the high school pitcher, displayed an underhand ball that delighted the Rotarian batters, who swung at it lustily and hit it once in a while. Gus Wright, President of the Rotary Club, used his ample chest to advantage in stopping balls that came towards second base. Gus Lee and Walter Schmid, who alternated at short stop, were quite delighted when the balls went in some other direction than towards them. Louis sales made two pretty catches and also a couple of pretty misses. No formal objections filed for George Schilling, but one member informed the Board he planned to make an objection. Board approved Mr. Schilling anyway. Board members asked the President to caution all members not to inform potential members that they were being considered until the Board had approved their membership. SRHS and SRJC student body presidents invited as permanent guest of the club during the school year. Boy Scouts running a deficit. Requested $900 to carry them to October 1.